Howdy, Garden Friends! If you are in the Portland area and are a Hardy Plant Society of Oregon (HPSO) member, look us up this Sunday the 15th from 11 - 2 as we're hosting an open garden! If you can't come out and visit, here's what the garden is looking like these days. For those of you in the neighborhood, we'd love to see you! 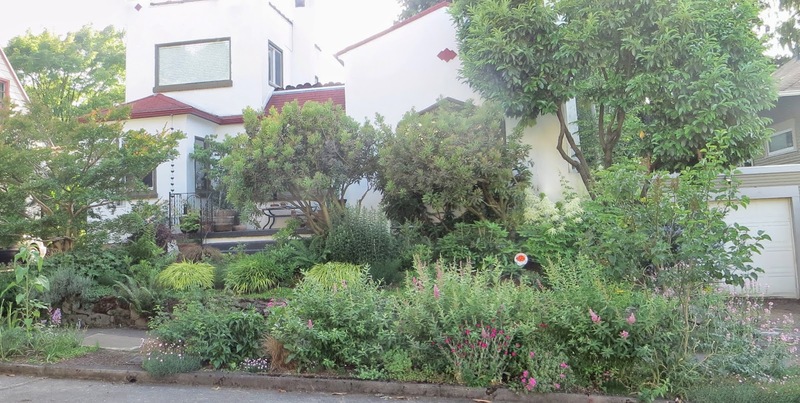 Here's my stitched-together photo of the whole front garden. It's getting there! The back garden from the vantage point of Eco-Roof #2. My beloved climbing rose, 'Eden' in white. We refer to this area as the "Jurrasic Garden." The Podophyllum pleianthum has taken over, and is taking names and hostages. Astilbe in the white garden. Silene asterias 'Cherry Drumsticks' purchased from Annie's Annuals last year. Only the one bloom so far, so it may be gone by the time anyone comes by! Still cool, though. Aaah, one of the trademark flowers of the garden, Mimulus aurantiacus 'Jeff's Tangerine'. One of two native honeysuckles in Chickadee Gardens. This one, Lonicera hispidula, finally bloomed after three years; the hummers love it. Aruncus dioicus or Goatsbeard, another native. No, not a native. This is actually Edelweiss, very dear to my heart. Sidalcea or checker mallow, another native. It blooms and blooms and blooms and the bees love it. It is underplanted with a dianthus, I do not know which variety but the clove-scented blooms are delicious. And here's Hobbes in action eating my grasses. Just look at that toothy face. He's busted. And here's what he looks like when he catches my gaze...he's all "Oh, hey...look at that bug over there..."
Some of the white shady-ish garden. Here's the bloom of native Spiraea betulifolia, purchased at Echo Valley Natives. The blooms are just about done now, but it's a lovely little deciduous sub-shrub worth noting. One of three cistus in the front hell strip pink garden. Tough as nails. Eryngium agavifolium, also in the hell strip. Bloom of Spiraea douglasii, another native sub-shrub. This one is very happy and spreading like mad. Great for hell strips and a magnet for butterflies and bees. Again, the Sidalcea campestris, this time backlit. See? The bees loooove it. A native penstemon, I have lost track which one this is. Anyone know? See the spider shadow in the sunflower? He's keeping it safe from sunflower munchers. Thank you, spider! Delicious blooms of native Philadelphis lewisii. The Ceanothus 'Dark Star' completely died on me. It was replaced with this, Callistemon viridiflorus from Xera Plants. Love it! Unica rubra 'Belinda's Find' with Heuchera 'Marmalade' in the background. So there's the quick and dirty tour. Hopefully, there will still be plants-a-blooming come Sunday and some good weather, too. Come on out if you are in the neighborhood! If you are not a member of HPSO and would like to be, go to their website for details. I encourage it. It's a great organization and one of the funnest aspects of being a member is being able to get a peek at hundreds of area gardens. That's it from Chickadee Gardens this time, until next week, thank you for reading and happy gardening! Thank you Jean for virtually visiting! I appreciate your kind words, too...thank you!! Oh, you are so sweet :) Thank you..the rose is my favorite...I love that Eden. Cheers! Your garden is looking fabulous Tamara, and kudos to you for doing the open thing. You're a trooper! Hobbs is a doll, grass eating to not. And I can't believe your C. 'Dark Star' died on you, I'm sorry. Thanks, Danger! Well, call us crazy...but it is fun to meet people who love gardening too and it forces me to get it all into shape. WOW, everything looks amazing! I can't wait to pay a visit - can't make it this year but next year...I'm dying for a visit! It looks wonderful, Tamara! We have a lot of the same plants, but mine are just a little bit behind yours. I hope you have a blast opening your garden. I'm planning to come down to Portland in a couple of weeks. Hi Alison, thank you :) Yours looks amazing too from the looks of your Bloomsday post....nice! If you are in Portland let me know and you can swing by since you can't make the Fling Tour, ok? I'd love to have you over! Looks so good! Love seeing so many natives, but balanced with other options. I'll have to settle for enjoying Chickadee Gardens on the Fling tour since we're traveling Sunday. Have fun with your open garden! Thanks for sharing with all of us via your blog! Your photos are always inspiring. We're newbies to natives, and just joined the HPSO in response to your most recent post. We would like to drop by your open garden, but don't know where it is! I logged into the HPSO site and couldn't find a link...is there one? I realize you don't want to post your address here...and this is very last minute...so maybe we'll just have to wait till next time. Hopefully we can figure things out with HPSO before the big garden tour on the 28th! So hope you had fun today, thanks for your great post for Bloomsday. Your garden is looking fab! Hello Lisa and Bud, thank you so much for coming by! I hope you get some answers about your birdies. We had lots of people come by, it was a ton of fun and the time flew by. Come again any time, we'll look for you next time we're walking your way. Cheers!! Can't wait to drool over this garden in person when the garden bloggers descend on you next month. I can already it's going to kill me to fall in love with plants there we can't grow here! Hi Vicki, thank you for reading the blog and visiting! Well, we can always claim you have zone denial and hide lots of little plants in your suitcase! Looking forward to meeting you!